With capacity utilisation falling to just around 50-55 per cent, domestic stainless steel makers are a worried lot over rising imports from China, Japan and Korea, an industry body said today. Against around five million tonnes per annum installed capacity, India produced between 2.4-2.8 mtpa stainless steel almost half of which is used in the making of utensils. India is the world's third largest producer also. "With growing imports from China, Japan and Korea, Indian stainless steel makers are in a fix. We will continue to bleed until basic customs duty on all the key raw materials in India are reduced to zero to ensure a level playing field," said N C Mathur, President, Indian Stainless Steel Development Association (ISSDA). ISSDA, which is set to celebrate its silver jubilee later this week, has already communicated its "issues" to the Steel Ministry hoping an amicable solution to the problem. Mathur also said that the basic customs duty on finished products should also be aligned with the rate applicable in China. Free trade agreements with Japan and Korea have also accorded benefits to these two Asian peers, he added. Imports of stainless steel from China are likely to go up to 2.5 lakh tonnes this fiscal from 1.13 lakh tonnes in the last fiscal. Out of total 4 lakh tonnes expected imports in the current fiscal, Japan is likely to contribute 60,000 tonnes and Korea 40,000 tonnes, Mathur said. Water management and research establishments normally explore contaminants that originate at the ground source and pollutants discharged into the main water bodies. They ignore the contaminants that come through corrosion of materials used for water distribution. Present regulations and standards available for infrastructure design, water quality monitoring, operation of aged distribution assets and most importantly, hygienic aspects do not provide any encouragement for corrosion control. High level of Iron contaminant cases reported in many leakage incidents clearly explain the alarming situation of corrosion issue. Our country uses mixed bag of old and new pipelines with major proposition of iron based materials to transport huge volume of water and distribute to numerous household connections. Contamination proliferates when water with original contaminants is transported through distribution system that uses a variety of unproven materials of construction and uncontrolled disinfectant process. The IWCEM - International Workshops, Conferences and Expo for Military and Marine Applications, were initiated in the year 2008. The events had support and participation from across the globe involving the Defence Services, Shipyards, Coast Guard, Industries, Professional Bodies, Research Organizations and Academic Institutions. The feedback system indicated the events as technically rich and well received with users giving out new projects and accepting transfer of technologies. The fifth edition in 2012, initiated an international technology meet in panel discussion format, synergizing and adding value to international cooperation in R&D and technology development. The IWCEM2015, with its motto ‘Igniting Research for Application’, conceives the event as an interactive platform for real time benefit to its participants. It provides opportunity to the industry for product display & presentations with the conference themes. While demonstrating the technical strength of participants in research & development, the technology meet concepts is expected review and initiate the international co-operation in process of product development and transfer of technology, accounting for futuristic user requirement and available R&D talent. The event will offer felicitations to veterans who have contributed to military and marine technologies. The ‘INAE Study Group on Indian Engineering Heritage on Metallurgy’ was constituted in 1996 to carry out studies related to metallurgical heritage. Prof. S. Ranganathan (Professor, IISc/NIAS); formerly, President, Indian Institute of Metals) was the founder Chairman of the Study Group which is now headed by Dr. Baldev Raj (President, INAE; Director, NIAS) as Honorary Chairman. The Study Group is actively involved in promoting the cause of Indian heritage in metals and alloys as well as in the conservation of archaeological relics of the country. Long term sustainability of these activities calls for building of human resources and an inter-disciplinary approach involving metallurgists, material scientists, historians and practising archaeologists. A knowledge of the scientific basis of conservation as well as characterisation techniques are key to the systematic learning and practising of this profession. A five day ‘School on Characterisation and Conservation of Archaeological Objects’, targeting students and faculties in archaeology, culture and archaeomaterials, is being organized by the INAE Study Group and will be held at CSIR-National Metallurgical Laboratory during 13-17 October, 2014. The school will cover classroom lectures by leading experts in various areas of conservation and characterisation, experimental demonstrations and visual displays. The NACE International Institute has awarded a contract to DNV GL of Dublin, Ohio and APQC of Houston, Texas for data management of the forthcoming International Measures of Prevention, Application, and Economics of Corrosion Technologies study (IMPACT). Under the contract, DNV GL and APQC will manage the compilation, analysis and integration of research and data for the IMPACT study. Previous studies on corrosion costs have focused only on costs in the US in a few industry sectors. The IMPACT study will provide a broader range of information by including global data, and by taking a corrosion management practice approach. In addition to analysing the cost of corrosion, this study will compare global practices in an effort to identify best corrosion management practices globally. Managed by former NACE International president and longtime corrosion industry advocate, Elaine Bowman, the IMPACT study will examine the direct and indirect costs of corrosion on several industry sectors worldwide. With the global cost of corrosion estimated at more than US$ 2 trillion (US$ 500 billion in the US alone) the study will also identify opportunities, strategies and techniques to cut corrosion costs by as much as 30%. Global in scope, the study will focus primarily on information collected from Australia, Canada, Europe, India, Japan, Latin America, the Middle East, the UK, and the US. There are also several industry advocates worldwide who have committed to providing support and data to the study or have committed to serving as technology contributors. Investigation found no unit had been set up to monitor water quality in Odisha. The Comptroller and Auditor General of India said 1.80 lakh people were forced to consume unsafe water supplied under 73 rural schemes due to the absence of a facility to test its quality in Odisha. According to CAG report on General and Social sector, a monitoring and investigation unit should be set up at the State headquarters for monitoring the quality of water. “All the water supply sources should be tested at least twice a year for bacteriological contamination and once a year for chemical contamination. Scrutiny of records found that such unit was not set up. “Due to the absence of regular monitoring and testing of water quality, 1.80 lakh people were consuming unsafe water from 73 RPWS schemes,” it says. “Executive engineer of Rural Water Supply and Sanitation, Bhawanipatna Division conducted water quality testing of 137 schemes which were not done since their commissioning. The test revealed that water under six schemes contained excess fluoride beyond permissible limit (1.5 mg per litre), which ranged between 1.58 mg/ltr and 1.72 mg/ ltr,” the report says. It maintains that these schemes were commissioned during 2007-13 involving an expenditure of Rs. 2.12 crore and allowed 0.15 lakh rural population to use water without ensuring the prescribed safety norm. Similarly, water supplied under 67 schemes had iron content ranging from 1.18 mg/ ltr to 6.5 mg/ ltr, which was beyond the permissible limit of 1.0 mg/ ltr as per Bureau of Indian Standard. These schemes were commissioned between 1993-94 and 2012-13 with an expenditure of Rs. 17.66 crore to provide safe drinking water to 1.65 lakh rural population. Though the water of these projects did not conform to the prescribed standard, they were not declared as defunct and no alternative measures were taken to provide safe source, CAG says. The agency also detects iron content to tune of 3 mg/ltr at Keredi in Kandhamal district. 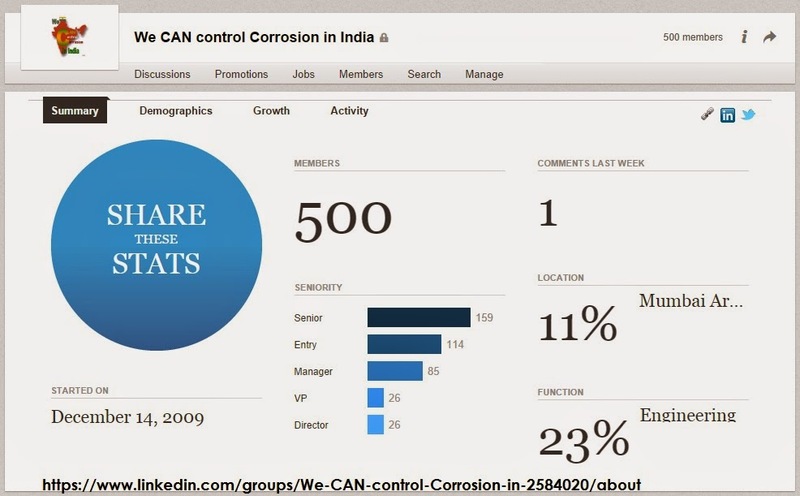 Arise, Awake and Collaborate to strengthen knowledge base of We CAN Control Corrosion in India, Science and Engineering Diaspora Knowledge Management Network - Members Strength 487 - Latest members are from USA, Algeria and India . Base metals rose at the non-ferrous metal market here today on stockists buying amid sustained demand from industrial users. The industrial metal, copper was little changed in early trade at the LME, shrugging of news that miners in Indonesia may soon resume ore exports that have been halted since January, while traders awaited a string of flash manufacturing sector reports. Tin and Nickel climbed by Rs 5 per kg to Rs 1,580 and Rs 1,245 from wednesday's closing level of Rs 1,575 and Rs 1,240. Copper scrap heavy moved up by Rs 3 per kg to Rs 489 from Rs 486 previously. Copper utensils scrap, brass utensils scrap and zinc edged up by Rs 2 per kg each to Rs 448, Rs 337 and Rs 194 as against Rs 446, Rs 335 and Rs 192 yesterday. Copper cable scrap, copper armature, copper wire bar, copper sheet cuttings and brass sheets cuttings all inched up by Re 1 each to Rs 495, Rs 471, Rs 523, Rs 464 and Rs 356, respectively. Issue of scarcity of water in Gole Market area here came up in Rajya Sabha today. Water is supplied through a single pipeline for water tank and quarters in DIZ Area, Sector 4, Gole Market. Replying to questions in this regard, Urban Development Minister M Venkaiah Naidu said doubling of supply pipeline is no solution to the problem. "Technically, there is no requirement for two separate pipelines for supply of water to individual terrace water tanks and for direct supply." He said efforts were on to augument the supply and the Central Public Works Department (CPWD) has been asked to replace pipelines which are "old and rusted". The Minister further said there is a concern all over the country on water as ground water was depleting and rains were getting scarce and stressed on rain water harvesting. AkzoNobelopened a new production facility in Thane, Maharashtra, to manufacture coatings for the metal packaging and flexible packaging industries on July 11, 2014. Built at an investment of Euro 1.8 million (about Rs 14.5 crore), the primary markets the production facility site will serve are India, Bangladesh, Sri Lanka, and Southeast Asia. This production facility, called Project ‘Taj’, has a capacity of 5000 tonnes a year and is set to produce a broad range of products including specialised coatings for food and beer cans, internal and external coatings for caps and closures, and water-borne external coatings for beverage cans. The new production facility will also be capable of producing various functional and barrier coatings for the flexible packaging industry. “For packaging coatings, we expect vigorous growth in South Asia to continue into the foreseeable future, so it makes good business sense to invest in production facilities to meet market demand. In India especially, we see enormous opportunities, and having the manufacturing capacity of Packaging Coatings, close to our customers’ means we can better serve them. As a good corporate citizen, AkzoNobel is very much committed to investing in the markets where we are active, as a way to better serve our markets and to provide opportunities for employment in those markets,” said Jayakumar Krishnaswamy, Managing Director, AkzoNobel India. The Thane production facility is modelled after the state-of-the-art infrastructure of AkzoNobel’s packaging coatings plant in Vilafranca, Spain. IL&FS Engineering and Construction Company Limited has bagged an EPC contract worth Rs 213 crore from Indian Strategic Petroleum Ltd (ISPRL), Ministry of Petroleum and Natural Gas, for laying of pipeline from Land Fall Point (LFP), Mangalore Port to Mangalore/Padur Cavern via intermediate valve station (IVS) from storage of crude oil project. The total length of the project is 50 km. The contract is to be completed within 15 months from the date of issue of LOA. The company is currently executing Halol Dahod pipeline project of Gujarat State Petronet Ltd (GSPL) on EPC basis. KOLKATA: International Zinc Association along with Hindustan ZincBSE 1.92 % is organizing an International Galvanizing Conference in Delhi on July 10- 11 2014. Around 150 Indian and International experts, opinion leaders, the makers of zinc, galvanizers, first and end users of galvanized products, including top industry executives from Railways, highway authorities, architects and design consultants would come together at the meet to deliberate on the issue of corrosion and discuss the issue of corrosion and discuss how to build sustainable infrastructure for the country. India is self-sufficient in both steel capacity, being the fourth largest producer in the world, as well as zinc capacity being the third largest producer, globally. However, in spite of adequate resources, there is huge untapped potential in India, as evident in the low per capita domestic consumption of steel at 57 kg against a world average of 215 kg, and low per capita consumption of zinc at 0.5 kg against a world average of 1.9 kg. However, India loses around 4-5 per cent of GDP annually on account of corrosion losses. Galvanizing is thus not only important for the long life of public structures, but also for the safety and security of the public using these structures daily. The country is going through the phase of urbanization and in the upcoming Infrastructure boom, in which galvanization plays a key role. The conference will be attended by minister for steel, mines, labour and employment Narendra Singh Tomar as Chief Guest, and minister of state for steel, mines, labour and employment, Vishnu Deo Sai as Guest of Honour. Other participants would include Tom Albanese, CEO of Vedanta Resources Plc., with key note address by International Zinc Association executive director, Stephen Wilkinson. Renowned analyst Andrew Thomas from Wood Mackenzie will provide industry outlook. Officials from Railways, CPWD, NHAI would highlight the potential for galvanizing, followed by sessions from architects, galvanizers and industry opinion leaders on galvanizing in public and private infrastructure.  Production and exploitation of Coal Bed Methane reserves will be accelerated.  Possibility of using modern technology to revive old or closed wells to be explored.  Usage of PNG to be rapidly scaled up in a Mission mode. 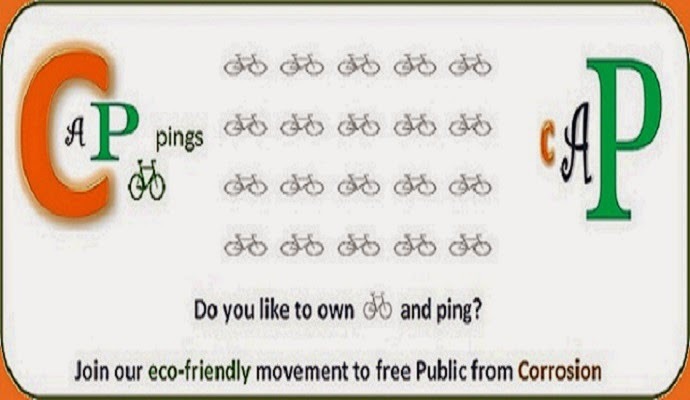  Proposal to develop pipelines using appropriate PPP models. 2) The BCD on ships imported for breaking up is being reduced from 5% to 2.5%. 3) Export duty on bauxite is being increased from 10% to 20% . 4) Basic Customs Duty on coal tar pitch is being reduced from 10% to 5%. 6) Basic Customs Duty on steel grade limestone and steel grade dolomite is being reduced from 5% to 2.5%. NACE International Gateway India Section is organizing CORCON 2014 International Conference and Expo on Corrosion, at Mumbai from 12 to 15 November 2014. CORCON 2014 will provide an excellent opportunity for exchange of information on matters concerning corrosion and its control. The hallmark of CORCON series of corrosion conferences is the support. NIGIS receives from industry, academia, R&D and defense establishments across the corrosion fraternity. It provides a unique networking platform for interaction amongst professionals related to the corrosion industry. registration as a contributory author. Cairn India Ltd. (“CIL”) is the Operator of the Offshore CB/OS-2 block, on behalf of itself and its Joint Venture (JV) partners Oil and Natural Gas Corporation Limited (ONGC) and Tata Petrodyne Limited, located off the west coast of the state of Gujarat, India. CIL intends to award a contract on lumpsum basis for 24” subsea pipeline cleaning and intelligent pigging operation. The Objective of the service is to do thorough cleaning followed by inline inspection using High resolution MFL type intelligent pigs to review, assess, evaluate, and determine internal and external metal loss post pipeline cleaning. Pipeline cleaning services include mechanical cleaning, supply of various types of pigs including calliper and gauge pigs, materials, spares & consumables, supervision, job expert, pig tracking system, etc. Intelligent pigging services include few cleaning runs prior to IP run, inspection tools, Analytical skilled person. The Pipeline for pigging is of 24 inch diameter with a total length of 35.05 km, with offshore subsea section of 31.55 km and onshore section of 3.5 km. The pipeline carries commingled oil and gas produced from the offshore fields to the Onshore Processing Plant. 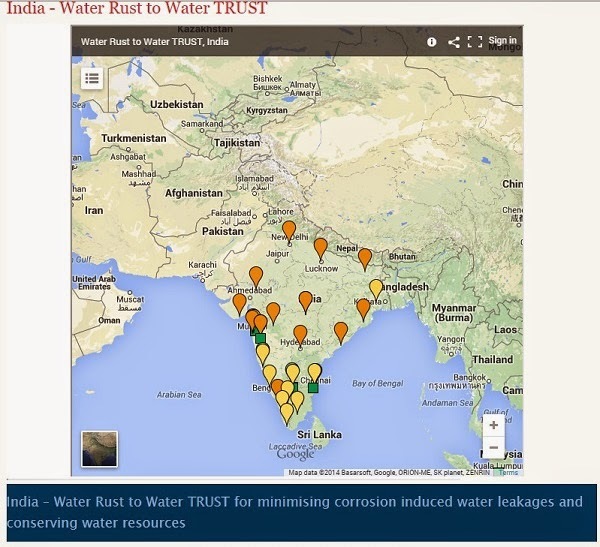 2014 edition of UN Water 'Water for Life' Awards goes to India and Singapore! 21 March 2014 - The 'Water for Life' UN-Water Best Practices Award intends to promote efforts to fulfil international commitments made on water-related issues by 2015 through recognition of outstanding best practices which can ensure the long-term sustainable management of water resources and contribute to the achievement of internationally agreed goals and targets. The 2014 edition, which focuses on 'Water and Energy', has been awarded on 21 March during the official UN ceremony of World Water Day 2014 taking place at UNU Headquarters, Tokyo, Japan. Category 1 'Best water management practices' has been awarded to a project focusing on policy research in co-management of energy and groundwater in India: The International Water Management Institute (IWMI)-Tata Water Policy Programme (ITP). Category 2 'Best participatory, communication, awareness-raising and education practices' has been awarded to a project focusing on wide-scale implementation and public engagement plan of reclaimed water in Singapore: the 'NEWater programme'. The world is getting thirstier and so is India. Many causes of increased demand are common at both the global and national level; increasing population, rapid industrialisation, higher standards of living to name a few. The only thing not increasing commensurately is the amount of water available. The UN Water Conference held in January this year delved into the water-energy nexus and portended that world water demand could exceed 44 per cent of the available annual resources by 2050. So how do these global trends look through the prism of the Indian experience? One consequence, here and elsewhere, is that water is moving up the boardroom agenda. The CDP Global Water Report 2014, authored by Deloitte, presents results of analysis based on the water disclosures of 184 Global 500 corporations. Participants included four major Indian companies. Almost three-quarters of respondents identified water as a substantive business risk. Challenges included business interruption due to inadequate public infrastructure, supply chain disruption due to water scarcity, and reputational damage. Water risk was seen as immediate. Two-thirds of the risks expected to impact direct operations and supply chains were anticipated to occur within the next five years. To give this local perspective, it is estimated that India has seen a 60 per cent decline in per capita availability of water in the last 50 years; while Ernst & Young predicts industry’s demand for water will grow from 40.86 billion cubic metres (Bm3) in 2010 to 91.63Bm3 in 2030. India envisages growth potential in shipping industry. The capacity expansion would be undertaken across cargo ships segment such as bulk carriers, tankers, etc. New building of ships is to be used for offshore oil & gas exploration, towage and coastal security. On the other hand, there is a greater shipping demand to deal with refurbishment of aged carriers. Industry analysis showed that over 41 per cent of Indian ships having crossed 20 years of operations leading to opportunities worth 20,000 crore in the shipbuilding and ship-repair industry sector. Ships older than 20 years require frequent and extensive repair and maintenance. This augurs well for the 7,300-crore worth shipbuilding industry, according to an analysis of Indian Shipping Fleet: Size, Capacity and Age Composition conducted by The Associated Chambers of Commerce and Industry of India (Assocham). It is said that India has a total of 1,122 ships in its fleet and 41 per cent of these, or 466 vessels, fall in the age group of 20 years and more. Considering that the average life of a shipping vessel is about 26 years, most of the existing vessels need to be replaced. An average cost of constructing a large vessel is about USD 100 million. Therefore, the size of this opportunity would be USD 3.3 billion. This whopping figure of refurbishment cost triggers the industrial community to explore the causes for failures. Although these opportunities are often linked with investment in this sector, this is not a good news for the life cycle analysis and material conservation. How do these failures happen? Corrosion of ship construction materials, the serious concern, often neglected by the industry is paving the way for greater impact in the life cycle cost. Marine fouling is another alarming area that fuels the parameters responsible for corrosion damage. These failures pose greater challenges to the ship owners not only in the materials part, but also leading to high demand for energy consumption and sizeable investment on environmental management. We see opportunities for establishment of academic and research institutions to effectively deal with developments in nautical science and engineering through various government schemes. But the effective dissemination of life cycle analysis of shipping industry, especially corrosion management, is questionable. Corrosion Management appears to be an iceberg for shipping industry in India. If the efforts on minimising the life cycle cost through implementing corrosion control methods and appropriate integrity assurance programs are attempted at very slow nautical pace, we will end up in loosing the significant material resources and heavily impacting our marine environment.